I thought my days of reading Ayn Rand were behind me. But a good friend recommended this book as a “gentle” version of Ayn Rand. 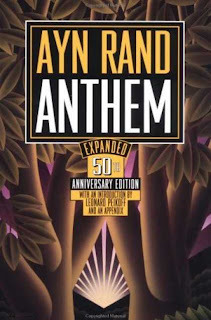 I couldn’t resist reading a book that received such a rare adjective about Ayn Rand! Everybody is familiar with Rand’s philosophy. This book espouses the same principles of Objectivism. But since it’s a novella, it’s short and effective in succinctly conveying the crux of her philosophy. The setting of the book is reminiscent of George Orwell’s 1984, and Lois Lowry’s The Giver. Humanity has regressed in the name of cooperation, equality, and order. It’s a society that results from an extreme form of Communism that eradicates an individual’s basic rights, freedom, and even identity. Everything is decided by the Council, everyone is forced to be equal to one another, forced to put the collective needs of the society ahead of their own, forced to follow the profession decided by the council, forced to stop thinking independently, etc. What might have been founded to bring about equality to all fellow human-beings is shown to have robbed the very spirit of freedom, identity, progress, and humanity. The protagonist writes about how he eventually breaks out of the shackles of this society to embrace freedom. He discovers the meaning of the word “I” and connects with the truth that the individual spirit needs to be revered and followed, not ignored and bent to someone else’s will. In principle, I do agree that the human spirit should be celebrated, appreciated, and respected. Self-interest is a key component of progress - both individually and collectively. It makes no sense for an Utopian world of complete equality between human-beings to exist, for all of us are different, and will remain different. A homogeneous world of equality is unnatural. And it’s absurd for socialistic principles that try to equalize quality of life for all, to turn civilization into the very opposite of their beliefs. It’s like morality and moral principles punishing the innocent. Everything makes sense in principle. But when they are executed literally, and taken to extreme forms, they all fail and end up resulting in a condition that contradicts the very same principles in the first place. I dread such stifling forms of socialism or communism where basic individuality and freedom is lost. But, I also dread extreme forms of capitalism where basic compassion is lost. I think a similar dystopian story can be written about the disintegration of human civilization due to extreme capitalism, ego, greed, and callousness. In extremes, every principle and theory fails and reverts to its antithesis. Every aspect of Nature’s design has a delicate balance of cooperation and competition. This balance is supremely vital. From a “selfish” standpoint, we all need to think of our fellow human-beings and care for their welfare as much as we need to honor our own independence and will. Neglecting one over the other will not work. Human society will not progress in either extremes. 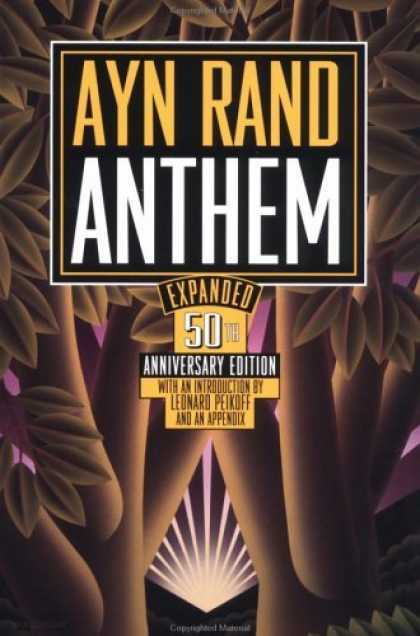 This is a good introduction to Ayn Rand for those of you who would like to ease into her philosophy :). I am always impressed by her vociferous, passionate words. She writes with so much conviction and confidence. Her words are great motivation when we need to summon the courage and confidence to follow our heart, stand-up for our principles, and express our freedom.